There’s one well organized ring of gold smugglers operating out of the gold strike camp of Cripple Creek, Colorado. There’s so much gold being smuggled out of the place that the Secret Service is concerned. Remember the USA was on the gold standard back then. So the Secret Service assigns agents George Montgomery, Richard Egan, and Jerome Courtland to go undercover and apprehend this gang. Courtland is young and impulsive, but both Montgomery and Egan think pretty fast on their feet as you’ll see as the story unfolds. Just about everybody of any importance in Cripple Creek is involved in the smuggling which is why the government hasn’t been able to get a handle on it so far. That’s why our agents really have their work cut out for them in this fast paced western. Cripple Creek is a competently made B western with a real twist at the end. Two twists in fact, especially when you find out who the head of the smuggling ring is and what’s the purpose behind all the gold smuggling. 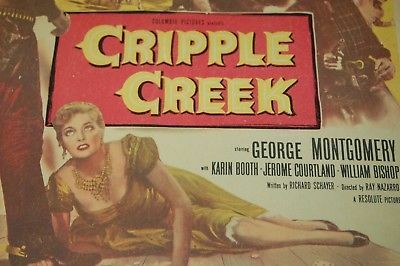 Cripple Creek is one western not just for the kid trade.